The voting has finished, the dust has settled, and three knights remain on top of the pile. 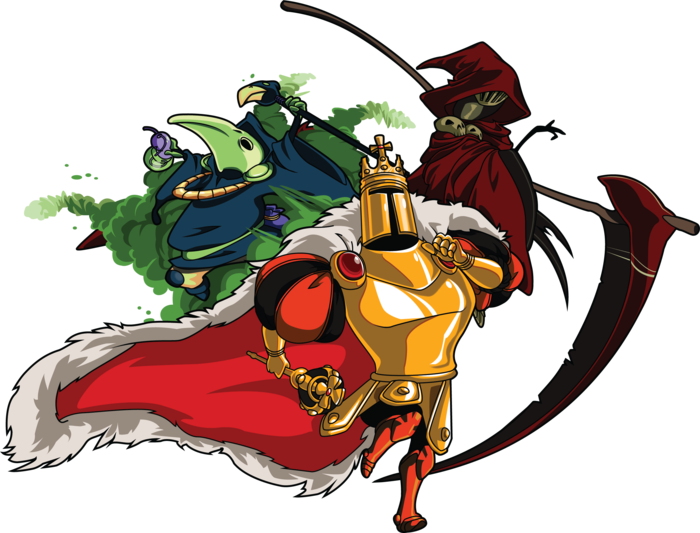 Yacht Club Games has revealed the enemy knights who will be getting their own campaigns in the game Shovel Knight. Spectre Knight, Plague Knight and King Knight emerged victorious after a single round of voting from the backers. Each will be taking on their own quest in the side scrolling action game due later this winter. The immortal and immaterial terror, Specter Knight, took first place easily! Now, his fate in the campaign is sealed. Get ready for scythe swinging and frail floating… it's hard to resist the allure of the undead. Plague Knight, reticent and reclusive, has been voted into the spotlight! Being in the spotlight makes Plague Knight a little uneasy, and when Plague Knight gets uneasy, things start to explode. This should make for an interesting campaign! That makes it 0 for 3 for me. I voted for Polar Knight, Propeller Knight, and Mole Knight, but I can't argue with these choices. There were really no wrong or right options. I might have only been upset with The Black Knight, who sounded like a glorified hard mode, and The Enchantress, because I never wanted to play as Dr. Wily in a Mega Man game. Shovel Knight will be released for PC, Wii U and the Nintendo 3DS this winter.